A man is able to fix his family's problems when Hanuman gives him super powers. 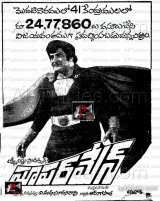 This 1980 Tollywood film is an ultra-cheesy rip-off of the DC Comics character Superman. It was a blockbuster in an India at a time when busting blocks must have been extremely easy. Superman (1980) A man is able to fix his family's problems when Hanuman gives him super powers. This 1980 Tollywood film is an ultra-cheesy rip-off of the DC Comics character Superman. It was a blockbuster in an India at a time when busting blocks must have been extremely easy..